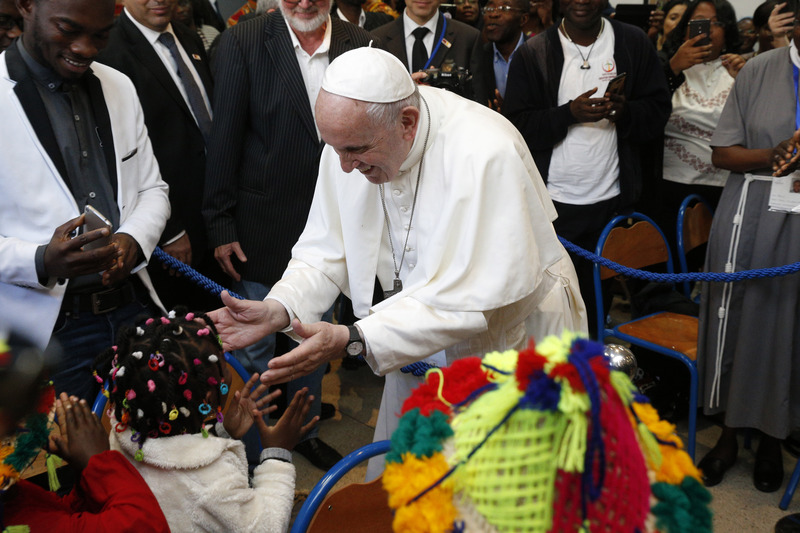 Pope Francis greets children as he arrives for a meeting with migrants in the Caritas center in Rabat, Morocco, March 30, 2019 (CNS photo/Paul Haring). Pope Francis concluded his first day in Morocco with a close focus on migration, speaking strongly on behalf of migrants at a small Caritas center in the capital city of Rabat. The center provides assistance not only to needy members of the local Moroccan population but also to more than 8,000 migrants each year from many African countries who see this country as a transit point to Europe. Francis had already addressed the question of migration in his address to the people of Morocco and government officials, but in his visit to the Caritas offices he returned to the question in more detail. Unlike his opening address, his talk at Caritas was not broadcast on national television, perhaps because the issue of undocumented migrants is a sensitive one in Morocco. Pope Francis: The faces of migrants "shatter and debunk all those false idols that can take over and enslave our lives; idols that promise an illusory and momentary happiness blind to the lives and sufferings of others." Tomorrow, Sunday, he will spend time with the Christian community in Rabat, and return to Rome tomorrow evening. Years ago, when I worked in a group home caring for disabled men, several of my co-workers were immigrants from Liberia. They had fled from a brutal civil war, seeking a better life for themselves and for their families. I believe in improving border security, but oppose building a wall along our border with Mexico. I agree with Pope Francis that it's particularly important to welcome immigrants who are victims if violence or extreme poverty. Although I don't think our nation has the responsibility to accept an unlimited number of immigrants, I do believe that we have the means to welcome many more immigrants.